How loud and how long people listen to music are two of the main drivers of noise injury that can lead to noise-induced hearing loss (the third driver, if you’re interested, is how often!). 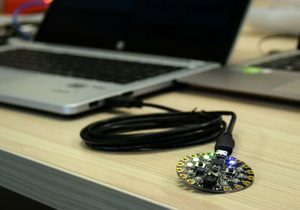 Last weekend, HEARsmart sponsored a wearable electronics hackathon and were delighted that someone came up with a potential gadget that could record and display basic information about the immediate and accumulating sound level being experienced. HEARsmart congratulated Stefan Burger (hackathon participant) on his invention and after some market analysis may pursue discussions about how it may be further developed for real world use. The Engineering in Medicine and Biology Society (EMBS) and Women in Engineering (WIE) from the Institute of Electrical and Electronics Engineers (IEEE) in Victoria organised the wearable technology hackathon on the 17th September. The event focused on the development of tools to assist individuals with hearing impairment or to prevent hearing loss using open source Arduino technology. HEARsmart, in association with our parent HEARing Cooperative Research Centre, was delighted to help support this fun event, “it’s great to get people from different disciplines and backgrounds to come together over the same problems and see what can be created” said Jane.